After an interesting year in 2018, the Indian women’s hockey team, led by the indefatigable Rani Rampal, is off to Spain to play the hosts in a 4-match test series. Following these matches, the Indians would also face the runners-up from last year’s World Cup Ireland in two tests. The four games against World Cup Bronze winners Spain would be held in the period of 26-31 January while the games against Ireland are scheduled for 2nd and 3rd February. Playing against the runners-up and 2nd runners-up would be a test for the Indian team that had mixed results last year but skipper Rani is looking forward to the opportunity with great anticipation. “The team is very excited to be playing against 2018 World Cup medal winners Ireland and Spain in the season opener. It will be a challenging tour no doubt but our team has made a lot of improvement in the past two years and we see this as a great opportunity to understand where we stand ahead of the Olympic Qualifying events this year,” she stated before departing for Europe. The 18-person squad selected for the tour is devoid of some senior names such as Namita Toppo and Sunita Lakra due to them being rested. The new faces in the group include Salima Tete, the talented defender who was the captain of under-18 team that secured silver at Youth Olympic games last year. Indian women’s team had a great 2017 where they secured the Asian Championship title but failed to secure a podium finish in the World Cup last year. Being the favorites to win Gold at the Asian Games, the team had to settle for silver after losing the Final to Japan. However, the captain is confident that her team is going to continue getting better and learn from past disappointments. “Though we surprised many with our performance against teams like England and Australia, we feel we could have done better in the 2018 Asian Games and 2018 World Cup. While we carry confidence from last year's events, we work everyday with the belief that we can take our performance to the next level and we certainly have the potential to do so. We have been receiving great support from our coaching staff in the past few months of training where we not only had to overcome the heartbreak of losing the 2018 Asian Games Final to Japan and a Quarter Final loss to Ireland in the 2018 World Cup but also introspect on the mistakes we were making. During the past two national camps, we have adapted to new techniques that will help us improve and we are confident of taking positive steps in our mission to qualify for Tokyo Olympics,” she asserted. While the men’s team is again in some sort of tumult with the resignation of coach Harendra Singh, Sjoerd Marijne is continuing at the helm of the women’s side. 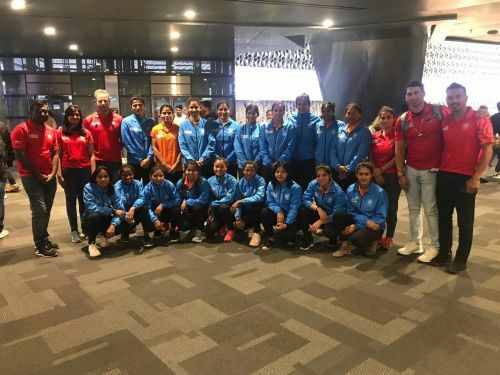 It was in the wee hours of Thursday morning that the team departed from the Kempegowda International Airport in Bengaluru.